After our trek to Mera Peak we had a couple of days to explore Kathmandu staying at the very pleasant Summit Hotel where we washed and relaxed and began to feel normal again. Kathmandu is a vibrant, bustling asian city although not as noisy as it used to be since the government banned the use of horns! Being driven around by taxi, though, is still quite an experience as we dodged endless scooters not to mention all the other traffic. The temples we visited are fascinating though visiting the Pashupatinath Temple where the hindus come to cremate their dead did feel like a slightly odd tourist attraction! 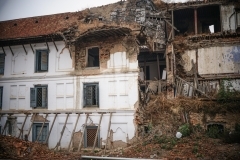 You can still see buildings damaged by devastating earthquake in 2015 which continues to have an impact on the country but most of the city seems to be functioning normally. Kathmandu has grown hugely since I was last there in 1983 when the population was under 300,000 – it is now approaching 1.5 million.